There is always something happening at the Atkins Building and the Atkins Newsletter has a helpful guide to what's happening and when. Atkins Building has a number of companies based in its office accommodation on Lower Bond Street plus a virtual office service where small companies can use the Atkins Building as a business mailbox and it has come to the attention of the Atkins Team that a small number of businesses are fraudulently using the Atkins Building as their trading address. Following on from the success of the Wedding Fair on Saturday 22nd Feb which promoted local Wedding suppliers and the Ceremony suite at Atkins Building, it also included a free prize draw to Win A Ceremony or a collection of Wedding gifts and vouchers from the Wedding Fair Exhibitors. 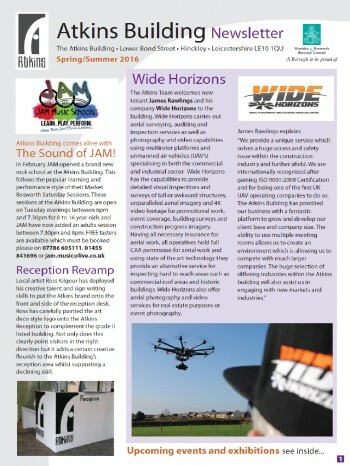 Please click on the Download Information link for the latest edition of the Atkins Building newsletter with details of all the upcoming events at Atkins Building including Fully Fashioned Memories Exhibition and Reunion party for all Former Atkins employees and friends. 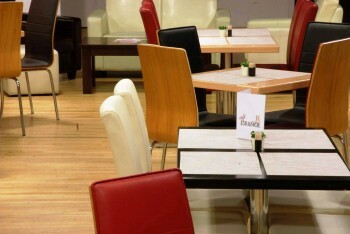 Atkins Networking returns this Thursday 24th Jan at 8am in Cafe Impressions, for £5 you will recieve 1.5 hours of networking with other local businesses, a hot drink and a bacon roll! 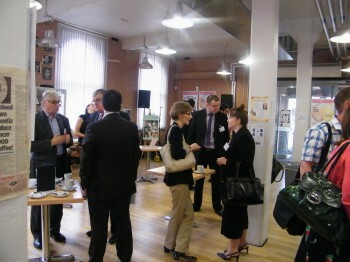 The popular and sucessful Atkins Networking group is back from its summer break. The first meeting is Thursday 27th Sept at 8am in Cafe Impressions at Atkins Building. For £5 you will receive a bacon sandwich or a pastry, plus a cup of tea or coffee to accompany the one and a half hours of networking with local business owners. 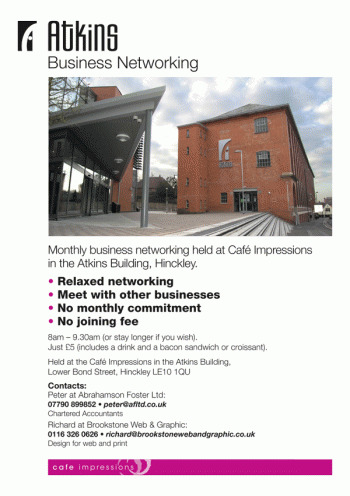 Atkins Building hosts the third local business networking meeting on Thursday 26th July 8am at Cafe Impressions. The first meeting of the new Business Networking meetings at Atkins Building start on Thursday 24th May 8am to 9.30am in Cafe Impressions. The meetings will be relaxed and informal, with the sole aim of helping fellow business owners meet each other over a cup of coffee and build up friendships and useful contacts, all for just £3 which includes one hot drink. Nine new offices will be available to rent at Atkins Building later this year when the top floor of Building 2 is going to be redeveloped. The smallest offices will be 140sq ft and the larger offices will be 284sq ft.
We want to provide our community with a valuable service by offering a free 15 minute private consultation to members of the public about a variety of different areas. We aim to answer all of those niggling questions about your finances that you didn't know who to ask! And for those whose affairs require further investigation or research; a full appointment can be scheduled with one of our advisers. The clinics are held in the Atkins Building meeting rooms on the first Wednesday of each month from 5pm to 7pm. A time slot can be booked via the website or by calling 01455 63 61 63. Alternatively you can drop in on the night and complete a form and you will be seen in time arrival order.